Again, Southern California burns this weekend as walls of flames blown by erratic high winds devour mobile homes and mansions without stopping to consider their worth. These annual wildfires care little if you live behind gilded gates or have a house jacked up on blocks...when they are headed down your canyon, you had better be running the other way. "Fire officials began an aggressive attack from the air at daybreak Thursday on the Tea Fire with the help of nine water-dropping helicopters and 10 air tankers, said Terri Nisich, a spokeswoman with the Santa Barbara County Executive Office. A high wind warning was in effect in Los Angeles and Ventura counties through Saturday, with possible gusts of up to 70 mph in some passes and canyons. "On the Sayre Fire, more than 600 firefighters struggled to protect homes threatened by flying embers. Because of the rough terrain in the forest, they were relying on water-dropping helicopters to tackle flames. Authorities said some aircraft were grounded during the night by the savage wind, but they expected six airplanes and a dozen helicopters to attack the fire during the day." 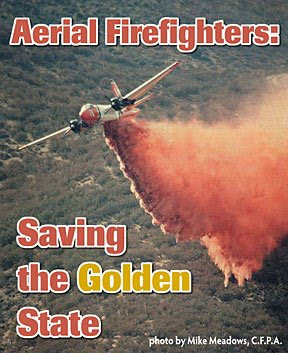 There are three primary kinds of aerial firefighting aircraft available within the U. S. Multi-engine airtankers are comprised of ex-military and retired commercial transport aircraft carry from 1800-3,600 gallons of retardant. These airtankers typically make retardant drops from a height of 150 to 200 feet above vegetation and terrain, at airspeeds from 125 to 150 knots. Small, medium and large helicopters carry from 100 to 3,000 gallons of water, foam, or retardant in either buckets slung beneath the aircraft, or in fixed-tanks. Large helitankers can be very cost effective, making rapid multiple drops of 2,000 gallons or more on escaping wildfires by refilling at nearby water sources or at portable retardant bases. Single Engine Airtankers (SEATS) carry from 400-800 gallons of foam or fire retardant. SEATS can operate from remote airstrips and open fields or closed roads, reloading at portable retardant bases. SEATS are predominantly modified agricultural aircraft; however, the 800-gallon Air Tractor 802 is designed specifically for wildland firefighting. Airtanker pilots, co-pilots, mechanics and other support personnel are highly experienced and well qualified for the aerial firefighting task. Pilots and co-pilots must meet rigid federal wildfire agency and FAA requirements. Captains of large airtankers and helitankers typically have 5,200-18,000 hours of flying experience, much of it in hazardous, low-level aerial firefighting. Pilots engaged in this profession must have a thorough comprehension of fuel models, fire behavior, weather, low level and mountain flying techniques, common fire terminology and tactics, risk and crew resource management, and coordinated retardant dispensing operations that integrate multiple types of aircraft. At the point of these battles with Mother Nature in California is the California Division of Forestry, aided by countless contract operators. Without these crew and equipment, the entire state south of Bakersfield would have been reduced to smoldering piles of ash years ago. So the next time you see an aerial tanker driver, or run across the crews that fill 'em up on the ground, make sure to say thank you, because the home they save tomorrow may be your own.